Wisconsin Microfinance borrowers: (Left to right) Donite Genestesh, Eliamise Elifice, Joe, Madame Saurel, and Elmise Joseph have used their funds to expand their businesses at the local marketplace in Bareau Michel, Haiti. 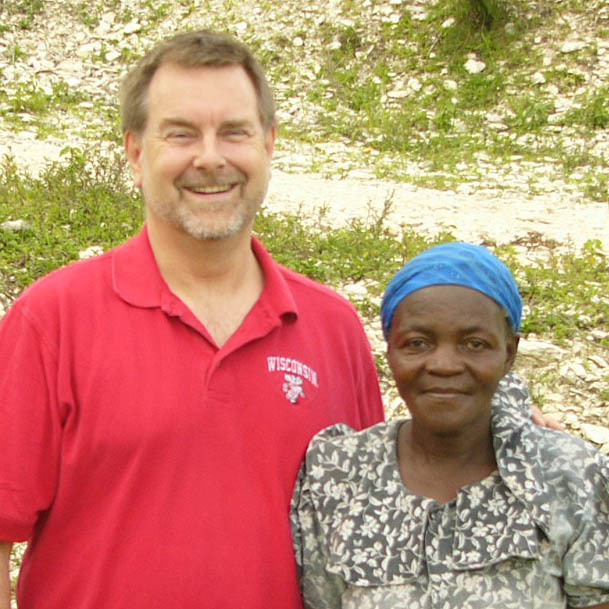 ​Posted January 2014—Professor Tom Eggert tells the story of Wisconsin Microfinance, a lending platform built on a relationship of trust between the University of Wisconsin community and a Haitian community. He believes it is a model that can be replicated by many research universities that have established ties in the developing world. I introduced a course on Systems Thinking and Sustainable Businesses in 1999 to students at the University of Wisconsin, Madison. This course has developed a sort of cult following, with students asserting that it has changed the way they think about business, society and individual responsibility. 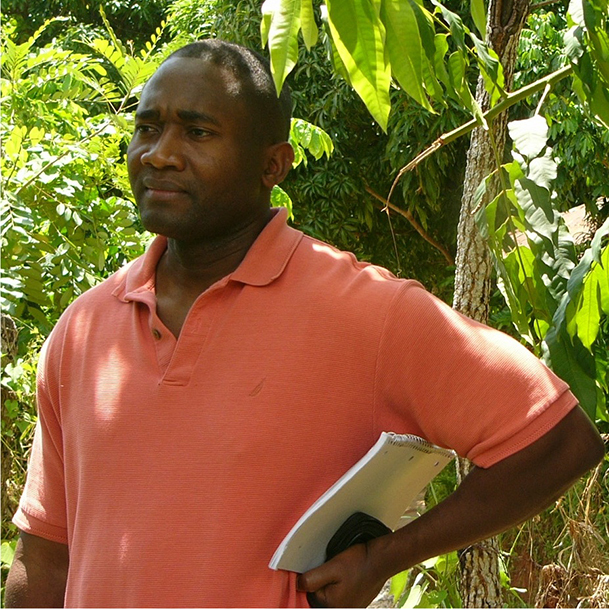 Gergens Polynice, a Haitian PhD student, had taken several other classes that I teach. In Spring, 2010, the same year as the devastating earthquake in Haiti, he was in my Systems Thinking class. The class felt the impact of the earthquake directly through Gergens, and raised $3000 dollars from family and friends. As a class we wanted to direct that money to people who were significantly impacted by the earthquake. We came up with the idea of creating a small microfinance project to get money into the hands of people who were looking to get their lives back on track. Gergens got us in touch with Pastor Walliere Pierre, who runs a non-profit in Port au Prince. Pastor Walliere was interested in piloting the use of microfinance principles in a community impacted by the earthquake. We had been talking about how microfinance worked in class, and used the infrastructure developed by the Grameen Bank as the core of the microfinance program that we created in Bareau Michel (a small crossroads community northwest of Port au Prince). The majority of initial borrowers were women and all had to be part of a borrowing group. No one individual would be able to get a second tier loan unless all the members of their group paid down their first round loans. This created peer pressure and social screening. As we developed the microfinance program, we solidified three components: Wisconsin Microfinance does the fundraising; CECFOP, a development NGO based in Port au Prince, receives the money from the US and oversees the distribution of the money; and the Bareau Michel Microfinance Oversight Committee implements the program on the ground. They make day-to-day decision about who gets loans. They collect the repayments and they allocate them to second, third and fourth tier loans. We also have visited Haiti twice since the original loans were made in the summer of 2010. CECFOP has now provided a project manager/accountant that visits the community and collects the information and puts together a report of how many loans we have made, the repayment rate, and how many people we are reaching. Since we started up the fund we have made loans totaling $9,000 to 180 people. One hundred percent of these loans have been repaid. Last summer we also introduced a questionnaire that assesses quality of life issues like health care, educational opportunities, infrastructure, and housing. We hope to be able to track the changes in quality of life in addition to repayment history. We introduced the first round loans at the equivalent of $62.50, with second round loans being about 50 percent more, about $95 dollars. We have people up to 4th and 5th round loans but, because of the size of the loans, we don’t have many of them. During our visit last summer, we asked the Oversight Committee to focus on bigger loans for those who had successfully paid back smaller loans, instead of continuing to grow the absolute number of loan recipients. This was hard for the committee, as they have over 800 people on a waiting list for a loan. WI Microfinance is different from Kiva. We are a pure charity model. Contributors in the US don’t expect to get the money back that they donate. Rather, the expectation is that all donations will continue to circulate through the community. We are trying to increase the amount of money that we raise on an annual basis. We have hundreds of people on a waiting list coming from fairly distant communities to Bareau Michel because of our microfinance program. Ideally we would like to expand microfinance oversight committees to other communities. Loans are used for a variety of purposes. Some people will borrow money, travel to the city 45 minutes away, and purchase supplies to sell in the local market– anything from clothes, to food staples, to Coca Cola. There are also agriculture-based loans for buying small animals or seed. Then there are cottage industry loans for purchasing raw materials, cloth, and beads that the borrower can use to make into finished products for sale. I should add that currently all loans are for businesses that sell in the local community. If the issue ever arose, we would discourage loans to businesses that would export their products. We really want the community to develop businesses that meet the needs of their neighbors. Haiti was once a major sugar and coffee exporter and now they are net importers of everything. They have become a very import dependent country, and much of the infrastructure that existed to support the export of agricultural products has fallen into disrepair. And, while we don’t provide business ideas, or specify what kinds of businesses should be developed in Haiti, we are hoping for businesses selling more sustainable products (such as solar lights, medicines, etc). We talk about this in class a lot. Is there a role for WI Microfinance to suggest the kinds of businesses that should be started? If someone would ask for expertise, or ideas, or how they might solve a particular problem, I think we could be a resource and offer ideas, but we can’t be in a position of telling them what to do. We have carved out our niche as a small microfinance institution. There are others like Fonkoze, Haiti’s largest microfinance institution, where their smallest loans are way more than our borrowers are interested in. None of our borrowers have graduated to them yet but we hope we will have some doing so soon. There is a hunger in the people in Haiti for the opportunity to take control of their lives. They are not lazy, helpless or incompetent. What they are, is poor. This trait they share with more than a billion people in other parts of the developing world. But, poverty IS something that can be addressed, and groups like Wisconsin Microfinance can play an important role in providing access to funds. Many research faculty, both at the University of Wisconsin, and other universities, have long-term, continuing relationships with communities in the developing world. I believe these relationships are the key to successfully reproducing the model that we have developed.